The card game "Goldfish," also known as "Go Fish," "Canadian Fish," "Russian Fish" or just "Fish," is popular with children ages three and older. The instructions are easy to follow and the game can be played with two to six players. "Goldfish" is played with a standard 52-card deck or a colorful deck of 36 fish cards. If two people are playing, each player is dealt seven cards; if there are three to six players, each player is dealt five cards. The remainder of the deck is stacked face down within easy reach of everyone. Players hold their cards so they can't be seen by the others. The object of the game is to collect pairs, or books. You collect sets of two with a 36-card deck or sets of four with a standard deck. 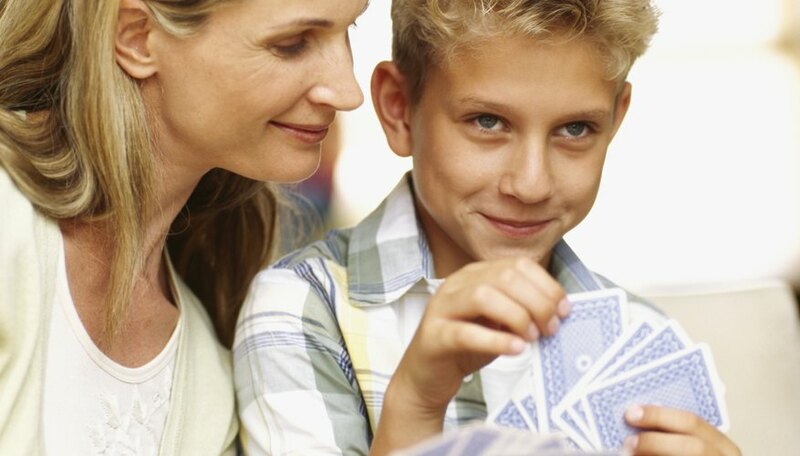 The player to the left of the dealer begins by asking another player for a card to match a card already in his hand. For example, if Eddie has an eight of clubs, he asks Sue, "Do you have an eight?" If Sue has an eight, she gives the card to Eddie, who would then ask another player for an eight, or another card to match from his hand. If Sue doesn't have an eight, she tells Eddie, "Go fish." Eddie picks a card from the top of the stack of undealt cards. If he draws an eight, he shows the card to the group before putting it in his hand. Eddie's turn continues until his "fishing" yields a card other than what he was seeking. If he doesn't draw an eight, he puts the card in his hand without showing it. The next player to have a turn is the last one who told Eddie, "Go fish." Players have to lay their sets down, face up. When the fishing pile is empty, players keep asking each other for cards until someone runs out of cards. The winner is the player who has collected the most books.